I realize I keep mentioning this “Mexican shampoo” but never tell you exactly what it is. Well, here ya go. No more laziness. 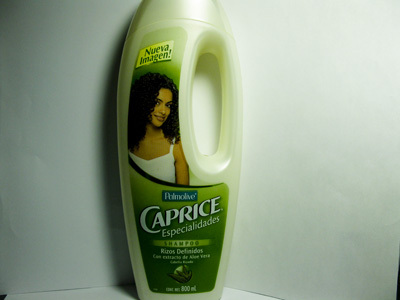 It’s Caprice, by Palmolive. The type is Rizos Definidos (Defined Curls). I actually really like this shampoo. It has slip! I was shocked. I threw away the bottle, but I’m sure it’s filled with horrible sulfates and drying agents, but something in this gives slip and I love it. I’ll check online to see if I can find the ingredients somewhere. When I go back to Mexico in a few weeks I think I’ll be buying another bottle! I still use this whenever I travel to a place I can buy it locally and can leave it there for the cleaning staff. I buy it whenever I cruise to Mexico or visit D.R. I also buy the conditioner as well. I have moved more toward “clean” or “green” hair products, but not exclusively. I'm just drawn to the design of the bottle. Lol. Yo tambien! It is kinda cool right…like futuristic shampoo. And it's BIG too. Amiga! You can get Caprice at Wal-Green's!!! I saw it yesterday? Not sure if it's because I live in Little Mexico (Texas) but we definitely have it here!